We flew out from BKK at the ungodly time of 0445 hours on 16 July and, due to the time difference, arrived at LHR at 1100 hours on the same day! We collected our rental car from Avis and drove down to Swanscombe in Kent, which is where my Aunt Edna & Uncle Albert live. We spent the week pottering around and only headed up to London for one day for SP to do some shopping at Frey Wille. The highlight, apart from spending lots of time with Auntie Edna & Uncle Albert, was a visit to Ightham Mote in Kent - a National Trust property. It is one of the oldest and loveliest medieval manor houses to survive in England. It has never been a grand manor but it is the product of six centuries and it has well and truly stood the test of time. Its hidden site at the foot of a wooded cleft of the Greensand Ridge in the Kentish Weald would have made it almost unapproachable in winter before the lane surfaces were hardened. Definitely worth a visit if you meandering around Kent any time soon. 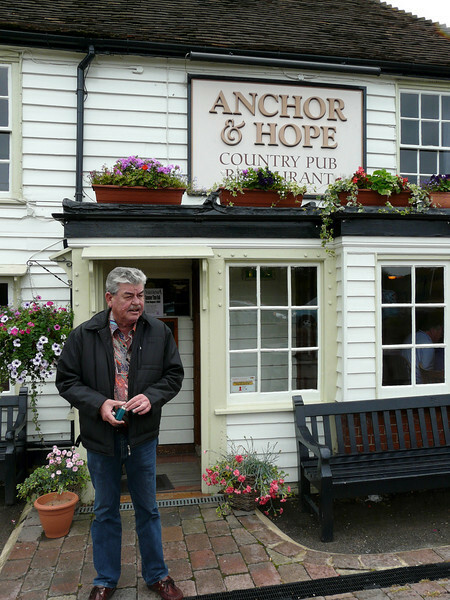 GA at the Anchor & Hope pub in Kent.